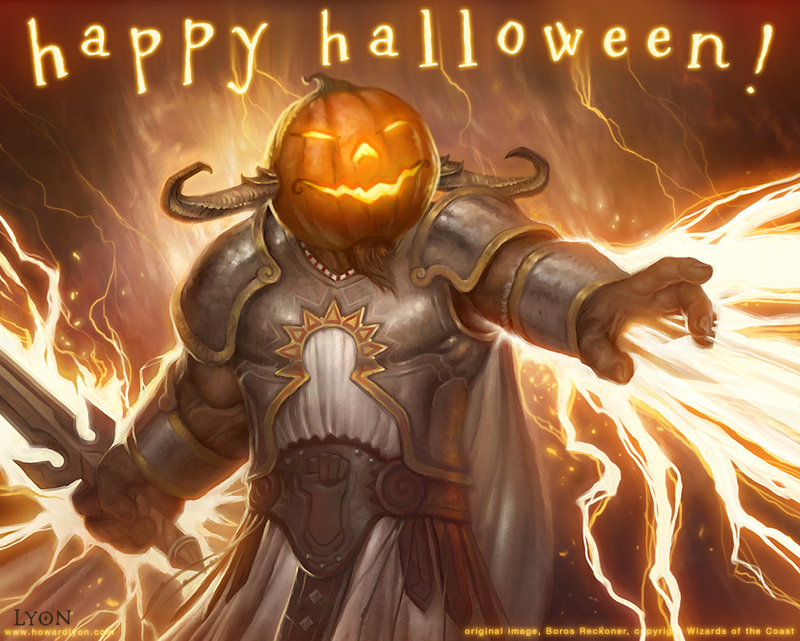 Happy Magic Halloween from the Pumpkin Reckoner! This painting is a little different than most of the work on my site. I was commissioned to paint the passage in the New Testament describing Christ calming the tempest. I wanted to use the painting to show the range of emotions, from fear on the far left, to faith on the right. The closer the disciples are to the Savior, the more they turn to him, the more their faith increases and fear is pushed away. The man on the far left is trying to save himself, he cannot see Christ and is in darkness, afraid, looking out at the storm. The next two disciples, struggling with the rigging of the boat, are just starting to turn to Christ, though they are still engaged with trying to save themselves. They are looking towards Christ and their faith is growing. The man behind the mast was just a moment before grasping the sail, trying to right it. At this point he has let go, and is turning towards the Savior. The next three disciples have nearly pushed their fears away. They are focused on Christ and the storms and turbulence of life have been tempered with a feeling of peace. Finally comes Peter, kneeling at the Savior's feet. Just a moment before, when the storm was raging, he had the faith to put himself completely in the hands of Christ, trusting Him, knowing that He would save him. As I worked on the composition of the painting, I started to relate to some of the disciples, more often to those at the back of the boat than at the feet of Christ. That is life though, learning, growing and better coming to understand your own spirituality. I can say that at the times when it seems my life gets hectic and the winds and storms blow (which isn't all that often, I have had a wonderful life), I know when I exert the faith to include God in my day, there is a little less fear, a little more peace. That is my thinking behind the construction for the painting. I hope it gives the pieces a little more depth. If you are interested in prints, email fineart@howardlyon.com for more information. A little side note. In doing research for the painting, I decided that I needed some significant reference for the boat. My wife and I did some research and feel that we had a pretty good idea of what the boat would look like. In fact, there is a full scale model of what they believe is a boat that would have been on the Sea of Galilee around the first century. It was, unfortunately in Israel, and that seemed a bit far to travel, not knowing if I would be able to even photograph it, let alone, light it the way I would need. Life has been wonderful, but busy. I spent a month this summer living in New York, studying at the Grand Central Academy. It was an excellent experience. I studied with Scott Waddell, Will St. John and Colleen Barry. All wonderful artists. I also spent a week at the beginning of the summer in Amherst, Mass. at the Illustration Master Class and made many new friends and learned more than I can say. If I were to sum up my experiences this year, between the Grand Central Academy and the Illustration Master Class, I could in one word: process. I believe more than ever that it is important to establish a process and then stick to it until you feel it isn't doing anything for you anymore. Thumbnails, color study, reference, models costumes, full sized cartoon, study of hands, faces, feet, final painting. Each one of those elements is critical in developing a great painting. It worked for Bouguereau, Leighton, Rockwell, Leyendecker... so many wonderful artists. The preparation is what makes the final happen. That is a lot of work and time invested, but it is how many of the masters achieved what they did. It has been a great year, I feel that I have learned more in the last year than any other. Part of that growth came from James Gurney's book, Imaginative Realism. It is a must have for any illustrator or fine artist. Many thanks to the kind and generous Mr. Gurney for sharing his experience. Go buy the book at Amazon, it is a bargain. Now, I will get back to publishing more art on this blog. I have been back almost a week from the Illustration Master Class and it continues to occupy all of my thoughts. Processing what I learned and excited for the future. I can’t wait to apply what I have learned to the next painting. All of the instructors gave me great gems of insight. Greg Manchess gave a wonderful lecture about design and overlapping figures in a composition. Scott Fischer spoke to me about creating the “unexpected.” Scott is full of a great energy and enthusiasm, drawing on everything around him for creative inspiration. Dan Dos Santos provided great samples of his process, showing the hard work and preparation behind the painting, a great reminder. He also gave me great advice on using oils. Irene Gallo had excellent feedback on my portfolio and Boris Vallejo and Julie Bell‘s paintings developed so quickly it was hard to focus on my own painting, as I wanted to watch them work. James Gurney presented lectures from his book Imaginative Realism, and his upcoming book, Color and Light. Besides being an incredibly nice man (and Jeanette his wife was fantastic too! ), he is a great teacher and speaker. Check out his blog, amazing! Jeremy Jarvis is hilarious. He had everyone laughing an kept things light, an important element after 6 days of 16 – 18 hours a day painting. He gave insights into the Art Director’s job and the process of developing and maintaining Magic the Gathering. Last and definitely not least, Rebecca Guay. Her work reminds me of the Pre-Raphaelites, with some Prud’hon, Botticelli, and Waterhouse influence as well. Delicate and beautiful with sensual lines and reserved values. Truly wonderful. This and she also organized the whole event. Thank you! I am off tomorrow for the 2010 Illustration Master Class. Really looking forward to seeing everyone and learning from the great selection of instructors. James Gurney, Rebecca Guay, Greg Manchess, Donato Giancola, Julie Bell, Boris Vallejo, Dan DosSantos, Scott Fischer and Irene Gallo will all be on hand to share and teach. I have met several of them before and they have always been gracious and generous. I am sure it will be a week to remember. If I don’t post over the next week, I will update when I get back, but I should have internet access. As part of the class, we were given a selection of wonderful assignments to choose from. I chose to portray Joan of Arc. Below is my color study. It is a painted background and then I pieced together a few different photos from the photoshoot to get the basic figure and painted on top of that to get to this point. The first thing we will do at the class is present our sketches, so I anticipate potential changes before I start the oil painting. Really looking forward to letting go of digital for the week and getting back to oils.